This year the ISA has the privilege of inducting John L. Brown into the ISA Hall of Fame. John is previously been inducted into the FSA Hall of Fame (2007), and also the USA Hall of Fame (2010). John was born in Covington, Indiana on July 21st, 1936. He first learned how to play shuffleboard at the age of 10, when his uncle taught him the game he would later teach to roughly 1,500 new players! Every week while in Florida during the winter John writes an article about shuffleboard for the Bradenton Herald, a local newspaper. John was on the committee for the 100th Anniversary of Shuffleboard in Florida in 2013, receiving the MVP pin for his lifelong efforts to promote shuffleboard. John and his wife Dolores have been very active in promoting shuffleboard internationally over the years. They attended inaugurals in Ireland, Denmark and Brazil – and he has competed in numerous ISA events, including traveling to Australia, Canada, Brazil and Japan. When you look at the ISA Constitution and read the objectives and purposes of the ISA, you will see that the purpose of the ISA is to promote the sport of shuffleboard in nations all over the world. John L Brown continues to embody all of these objectives and is therefore a worthy inductee into the ISA Hall of Fame. 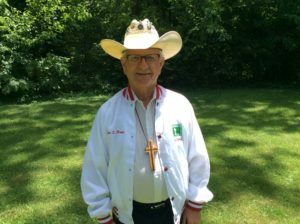 I am not sure which is more iconic that John wears – his cowboy hat, the cross around his neck, or his ever-present smile.